Pretty faces Atlanta was designed to meet the growing needs of concierge medical cosmetics and skin care patients in Atlanta. Pretty Faces Atlanta offers advanced skin care and cosmetics treatments. We are mobile and can come to you (or office, hotel, conference site, etc) for services as well. We support the Atlanta area and surrounding cities, and we have Concierge services, for additional fees, up to 25 miles of 30324. Dr. Jing Jing Harris is an Award Winning, Licensed Physician in the state of Georgia who specializes in Aesthetic and Anti-Aging Treatments. She is also a Boarded and Licensed General Medicine Provider. Dr. Harris is a MEDICAL Physician and Pretty Faces Atlanta is an Aesthetic Medical Practice. Though Dr. Harris specializes in Aesthetics, she is first and foremost a Generalist. Considering her primary training as a Family Medicine Physician, Dr. Harris has the most solid medical background to also comment on underlying medical conditions that can affect the overall health and appearance of your skin. Having completed her residency trainings with Loyola University, School of Medicine and Cook County Hospital Systems in Chicago, IL, Dr. Harris has more than a decade of additional, specific dermatology training, in both cosmetic and clinical dermatology. Dr. Harris has completed and instructed numerous dermatological and aesthetic courses. Dr. Harris attended both Morehouse School of Medicine and Xavier University School of Medicine. She is currently an adjunct instructor for several educational entities of higher learning and professional training, such as Morehouse School of Medicine Family Medicine and Internal Medicine Residency Training Programs, as well as Emory University Nurse Practitioner Program . Prior to Medical Training, Dr. Harris trained in Dietetics and Nutrition. Dr. Harris trained for numerous years under the direct tutelage of Dr. Welsey Wilborn, renowned Dermatologist, Instructor, Speaker, and Founder of DPL Cosmetics. Dr. Harris treats patients of all skin tones and ethnicity, and she has additional, specific training, in the treatment of minority skin complaints (including African American, Asian, Hispanic, East Indian, and other pigmented populations). 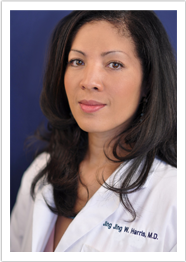 Dr. Harris specializes in ethnic specific cosmetic treatments of the face and body.